In my early days of competitive bodybuilding, I saw many competitors who trained other, lesser-experienced competitors for contests. I myself hired trainers to guide me in preparing for my contests. I got to know the names of quite a few local trainers. But after a while, I noticed something odd: these same trainers, when it came time for them to compete, hired trainers for themselves. I thought it odd because I reasoned that if these individuals were strong, wise, experienced, smart, and good enough to guide others, could they not guide themselves? Sort of a twist on the Biblical injunction: "Physician, heal thyself!" But as I thought about it more, it made sense. Bodybuilding contest prep is not an easy thing. The severe diet and exercise regimens mess with your mind. Substantially. Even if you are experienced, you may not be the most objective decision-maker regarding your own conditioning and regarding the necessary actions to take to perfect it. You need an outside set of eyes to help you see where your shortfalls are, where improvements can be made, and what to do in the way of a remedy for any lack. After a long time, it struck me that the situation is like Auricular Confession within the church. My naive view of bodybuilding coaches was akin to saying that certainly priests, being holy and good, and able to hear others' confessions, would not need themselves to confess! It is laughable, of course, and helps point out my mistake regarding the bodybuilding coaches. Priests confess, bishops confess, and even the Pope confesses. And professional bodybuilders, every one of whom has been victorious in high-level amateur competition, still have coaches. In the car hobby, "Trailer Queen" is the phrase chosen to describe a car so perfectly finished and so clean (at least in the eyes of its owner) that it is never driven on the street. It rides to shows on a trailer, preferably of the enclosed variety. But for the past 10 to 15 years, a backlash against Trailer Queens has sprung up. 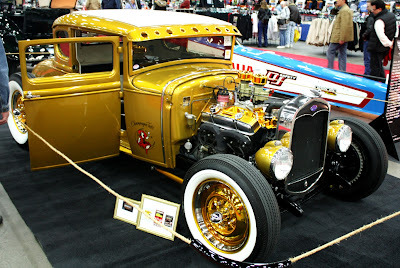 It is a back-to-roots kind of thing, fueled by the popularity of traditionally constructed rods and customs, as well as the so-called "rat rods", which are vehicles which are left without finished paint. 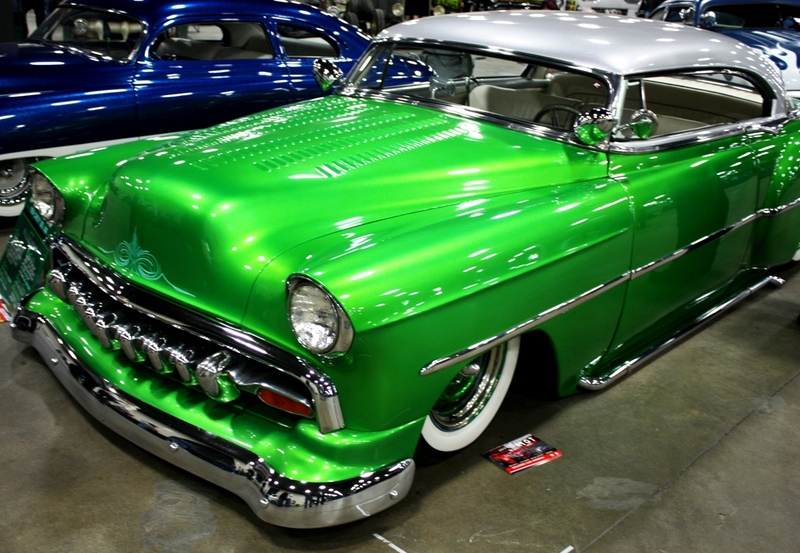 At the 2012 Detroit Autorama, we saw a beautiful bug-green custom that looked clean enough to be a trailer queen. 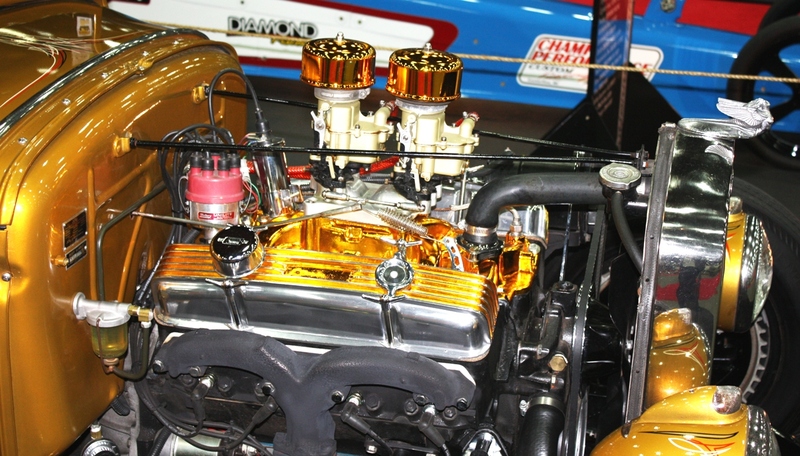 But, it was in the basement of Autorama, with the "rat rod" crowd. 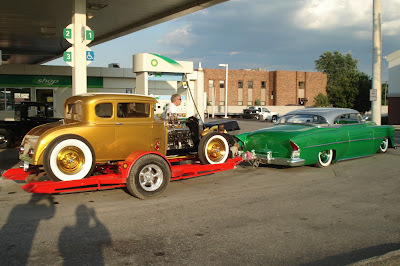 Only later did my son find this photo of the same car, towing a beautiful gold hot rod. So, not only is this beautiful lead sled not transported on a trailer, but itself is used as a tow vehicle. Bitchin'!! I wish I knew who owned these cars, so I could give proper credit. If I see them at any of the shows this summer, I will find out the owners' names. Below are photos I took of the cars at Autorama, before finding the photo above.